For one hour you have driven your horse into the ground, picking up his shoulders with your arms. Driving back home, your shoulders are screaming and your back is in agony. A thought is pounding in your head: “This cannot be right”. Your left brain finds rationality in the fact that you are gaining decent scores in the show ring, but your right brain desires more wisdom in your relationship with your horse. You would prefer to have willing partner over an obedient but subdued one. The system wants you to “put the movements on the horse,” following a logical order referred to as the pyramid of training. But you see the metaphor through a different angle. A pyramid is primarily a tomb and you feel that while riding your horse into the ground, you are driving your horse, your spirit and your wishes into a grave. You have read “Ride your horse into heaven and not into the ground” (Walter Zettl) and you like the thought. However, the only advice you ever receive when wondering how you and your horse may achieve that lofty goal is to half halt, which translates into more weightlifting. What is your alternative? A return to the past perhaps, but our ancestors’ doctrines were not created for the demands of modern competitions. You like the lightness of the classical approach but you are hesitant to devote your faith to another doctrine. Would there be a way to move forward into lightness? As a matter of fact, genuine forward movement is the outcome of lightness. A horse can be fast and heavy on the bit, but not truly forward. When speed is generated, the equine vertebral column mechanism increases the rigidity of the thoracolumbar spine. A similar vertebral rigidity occurs when the horse is pushing on the bit. Our ancestors did not have the measurements that are available to us today. However, they had the sensitivity, skill and clairvoyance to warn: do not confuse speed and impulsion. The horse’s biological mechanism is about external and internal forces acting on the vertebral column, and the muscular system of the vertebral column managing these forces within the limits of the thoracolumbar column’s possible range of motion. External forces are essentially gravity and inertia. The combination of both forces is often referred to as accelerations of gravity, which are evidently aggravated by the rider’s weight and movements. Internal forces are essentially produced by the hind and front limbs. Between alighting and push off, the support phase, which is also referred to as the stance, can be divided into two successive sequences: the braking phase, which commences at impact and lasts through almost half of the stance, and the pushing phase, that lasts until push-off. Forward movement is not concerned with how much the horse’s body is moving forward but rather how well the thrust generated by the hind legs is transmitted forward through the horse’s axis of motion, which is the vertebral column. Support is achieved during the initial 45% of the stance, which is the braking phase. The label braking phase is in reference to the muscular work of the limb on support, which resists gravity and inertia. The braking phase is in fact the sequence of the stride where the hind limb on support carries the horse. The pushing phase is achieved during the second half of the stride, practically from the moment the hind leg is almost vertical under the croup to the moment where the hind hoof clears the ground behind the horse’s body. That is why the net effect of the hind legs is a force in the direction of the motion. Our ancestors believed that the horse’s self carriage was the task of the hind legs. In reality, 57% of the vertical impulse is created by the forelegs. Therefore, forward movement, which includes balance control, results from the coordinated action of the hind leg on support, which produces a force in the direction of the motion, and the foreleg on ground contact that propels the horse’s body upward. A horse adjusts braking and pushing activities of both the hind and front legs, in respect to the body situation and the demand. For instance, if the demand is piaffe, the hind leg on support will increase the braking activity in order to resist forward shift of the body over the forelegs. Hence, efficiency in the horse’s gaits and performances relies on the rider’s ability to enhance the forelegs’ upward propulsive activity. In this matter, research studies suggest a new level of thinking. Elastic recoils of the tendons more than muscles move the legs. The main function of the muscles during locomotion is to optimize the tendon’s elastic strain energy. The forelegs are often compared to a pogo stick designed to recoil to a certain intensity as well as frequency. When the stress induced on the spring of the pogo stick corresponds to the integrity of the spiral structure, the elastic recoil is optimum. By contrast, when the weight overloads the integrity of the spring, the rebound is hindered. Similarly, excessive weight on the forelegs hampers the forelegs’ capacity to produce optimum upward propulsive force. The horse then achieves balance control by increasing the forelegs’ braking activity. A horse that is uncomfortable to sit is often a horse controlling balance by opposing the forelegs’ braking activity to the hind legs propulsive force. The load on the forelegs can be regulated by the biomechanical properties of the horse’s vertebral column. Each vertebra of the thoracolumbar spine has the capacity to convert the thrust generated by the hind legs into horizontal and vertical forces. Horizontal forces are transmitted horizontally from one vertebra to the next. They are the forces creating forward displacement of the body. Vertical forces are created by the vertebrae’s rotary systems. They are the forces resisting gravity and therefore creating balance control. Combined with the fact that forces traveling horizontally through the spine are submitted to the attraction of gravity, the pelvis elevation that occurs at the push off of the hind legs loads the forelegs at the anterior end of the thoracolumbar spine. Later, James Rooney explained how the main back muscles, which are set in mirror image direction, convert the thrust generated by the hind legs into horizontal and vertical forces. Both Rooney and Richard Tucker explored the equine vertebral column mechanism from a dynamic perspective. Based on their studies as well as the work of many others, we explored an equitation matching the biomechanical properties of human and equine vertebral column. The horse’s limbs induce forces on the vertebral column that are resisted and reduced by the vertebral column muscular system. Likewise, the rider’s vertebral column reduces the forces induced by the horse’s limbs into a range of motion that match the horse’s vertebral column range of movement. Such supple resistance is achieved utilizing the cervical, thoracic and lumbar curvatures of the vertebral column. Conventional equitation attempts to influence the biomechanical properties of the horse’s thoracolumbar spine by acting on the extremities: the hind legs at one end and the flexion of the neck at the other. Considering that the normal numeration of the horse’s vertebral column is 6 lumbar vertebrae, 18 thoracic and 7 cervical, there are at least 31 reasons why acting on the extremities may end with a dysfunctional thoracolumbar spine. Considering that the rider’s back and seat are in direct contact with the horse’s vertebral column, a more rational approach is to act directly on the horse’s thoracolumbar spine, matching the biomechanical properties of both the rider and the horse’s vertebral column. The range of motion of the horse’s thoracolumbar spine is extremely limited but the diversity of movements is considerable. The horse’s vertebral column orchestrates a large diversity of movements within the limits of a minuscule range of motion. The task demands a sophisticated control center, which is the horse’s brain. Through intelligent questions, the horse’s brain can be guided into sophisticated orchestration of the vertebral column mechanism and therefore, advanced body control. Such education is based on the partnership of two intelligences: the rider’s intellect which has the capacity of analysis and the horse’s mental processing which must incorporate the rider’s insights. Such education is based on kindness and respect. A horse brings his athletic abilities into the performance but also a central nervous system designed to protect a problem rather than work toward a better future. Thus, repeating the movement does not educate the horse’s physique. Instead, equine education needs to create the body coordination appropriate for the effort. In the 18th century, Monsieur de la Gueriniere furthered Newcastle’s idea and created the shoulder-in. La Gueriniere emphasized an oblique and circular posture inducing the lowering of the inside haunch. After La Gueriniere, some focused on the obliquity, others on the bending, but no-one could figure why the shoulder-in was helping some horse to lower the inside haunch and was not having the expected effect on other horses. At the 19th century, Gustave Steinbrech furthered la Gueriniere’s thoughts. In Steinbrecht’s mind, the horse’s shoulders are narrower than the haunches. The German author observed that if one is keeping the horse’s haunches absolutely straight and pushing the horse’s shoulders slightly toward the inside placing the inside foreleg in front of the inside hind leg, the horse then bends the thoracic spine creating a body coordination appropriated for the shoulder-in. Steinbrecht named the concept shoulder-fore. All three classical authors were visionary. They basically discovered a phenomenon that was explained at the 20th century. Transversal rotation induces lateral bending and lateral bending stimulates transversal rotation. However, lateral bending can be associated with a correct or inverted rotation. Proper rotation allows the horse to perform efficiently. But in contrast, inverted rotation induces strains and shearing forces on the vertebral structure. Gustave Steinbrecht observed that creating transversal rotation and shifting the horse’s shoulders toward the inside, lateral bending was induced. Through proper correlation between lateral bending and transversal rotation, Steinbrecht’s shoulder-fore optimally prepares the horse’s physique for the shoulder-in. Steinbrecht did not write “Gymnasium of the Horse”. The German trainer gave his notes to his student Paul Splinzner, who wrote the book. Page after page after page, Steinbrecht described in his notes in great detail each one of his actions as a rider as well as the many nuances observed with different horses. Steinbrecht noticed that better work was obtained with the shoulder-in when the horse’s body formed an angle of 30º with the rail. The horse was then traveling on three tracks. This was missing completely the function, that is, the proper correlation between lateral bending and transversal rotation; judging standards concentrated on the form alone, the horse’s body forming an angle of 30º and traveling on three tracks. A century earlier, François Robichon de la Gueriniere warned against the false practice. The French author sensed the difference between proper and incorrect transversal rotation but did not have the support of the scientific knowledge to explain his sagacity. Monsieur de la Gueriniere’s shoulder-in demands, effectively, a proper correlation between lateral bending and transversal rotation. Unfortunately, the rest of la Gueriniere’s sentence leads to confusion. 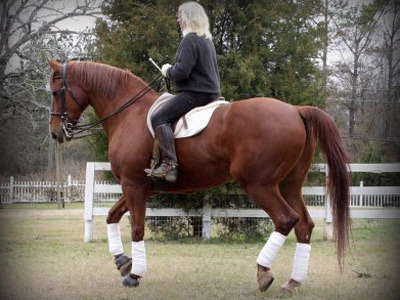 The classic author advises aiding the horse in his lateral motion “with the inside rein and leg”. The words aiding the horse were carefully chosen. However, the practical application became a rein and a leg pushing the horse’s sideways. In doing so, la Gueriniere’s shoulder-in becomes a leg yielding type of movement and creates inverted rotation, and therefore a dysfunctional thoracolumbar spine. La Gueriniere emphasizes the ability of the shoulder-in to lower the inside haunch. “The shoulder-in prepares a horse for placing his weight on his haunches because, with each step that he takes in this posture, he brings the inside hind leg forward under the belly and places it over the outside hind leg, which he cannot do without lowering the haunch.” The lowering of the inside haunch is only possible if the combination between lateral bending and transversal rotation is correct. Inverted rotation gives the opposite result: lifting the inside haunch and rendering the adduction of the inside hind leg difficult. There is no doubt that if la Gueriniere had, in the 18th century, the benefit of modern research studies, he would have described the shoulder-in in other words. So would have Gustave Steinbrecht explained the shoulder-fore differently. Also the Duke of Newcastle at the 17th century would have been able to explicate why and under which conditions, the adduction of the inside hind leg enhances the suppling of the inside shoulder. The wisdom of centuries is a treasure of knowledge but neither the equestrian language nor the equestrian literature conveys accurately our predecessors’ thoughts. Words are ill adapted to the task of explaining forces and ultimately, gaits and performances are all about the interaction of forces. From the most fundamental elements of locomotion to the components of the most sophisticated athletic performances, the knowledge of the mechanism of the equine vertebral column is the missing link of classical wisdom. As well, without knowledge of the underlying biomechanics factors, contemporary judging standards are not by any means valuable training tools. Great athletes, whether human or equine, have always been able to perform through their talent and despite unsophisticated training techniques. They are talented but dysfunctional athletes and therefore they can only perform below their full potential; they cannot fully benefit from innovative training techniques, and their career is likely to be shortened by injury. A recent study found that at least 38,000 years ago, Neanderthals interbred with Humans. An estimated 1 – 4% of DNA of any human came from Neanderthals. Perhaps, riders with a higher percentage of Neanderthals’ DNA may be satisfied with unsophisticated and heavy riding techniques. However, the findings also allow a large percentage for intelligent equitation, a partnership which leads the horse’s brain toward a coordination of the horse physique precisely adapted to the performance. This is the alternative offered by the science of motion.